That new samurai game wasn't Way of the Samurai. Famitsu this week has a six-title feature on Spike Chunsoft, unveiling three new games from the Danganronpa publisher. The first is a pair of samurai games for PlayStation 3 and PS Vita. The PlayStation 3 game is titled Ukiyo no Shishi (Patriot of the Fleeting Life), and the PS Vita game is Ukiyo no Roushi (Ronin of the Fleeting Life). 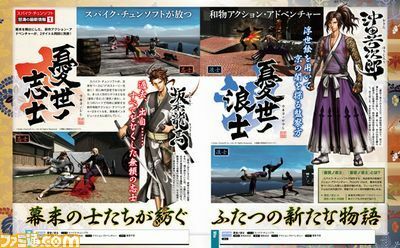 These titles make up what everyone mistook as the new Way of the Samurai at Sony Japan’s September 1 press conference. The next title is for 3DS. 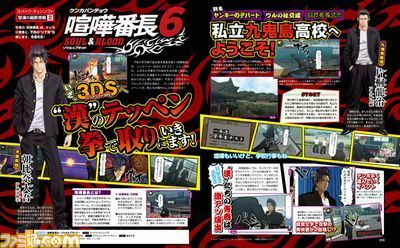 First teased during a July Nintendo Direct, it’s titled Kenka Bancho 6: Soul & Blood. Also in the feature are The Witcher 3: Wild Hunt, Metro: Redux, and the PlayStation 4 version of Terraria, which Spike Chunsoft are localizing, and news on the latest Sekai Seifuku: Costume Fes. update.